Greenhouse Catalog staff member Michael Taylor has volunteered over the years to help the Marion-Polk Food Share in their endeavors to stop hunger. 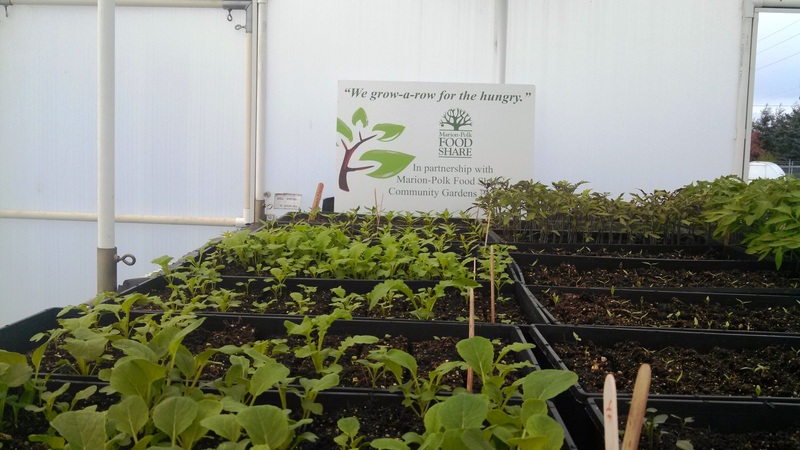 During Michaels good will journey he approached Michelle Moore, President of The Greenhouse Catalog and asked if the Food Share could move into our 16’ x 20’ Solexx Conservatory Greenhouse to get a head start on growing plants for their community garden. You can see by the photograph that Michelle said yes and we are now on a roll! This has been a fantastic way to start the 2014 Spring Season, knowing that we are helping to make a difference in the lives of others. We will post additional photographs as we move through the season. I love to hear stories about how a family puts a greenhouse to use. This family bought a large greenhouse to not only grow food for the family, but also to sell produce at the local farmers market. They will be the first to bring tomatoes to the Farmers Market in this small town in Idaho. Lydia and Annie Barnett aim to be the first to sell ripe tomatoes at Dale’s Saturday Market. And they think they can make good on that goal in the next two weeks. Are you wondering in these tough times what you can do to help? I found this newsletter article from Front Range Living (I highly recommend subscribing to their newsletter) that has some useful ideas for helping out your community and neighbors and making sure your family has plenty of food as well. STARTING A SUSTAINABLE SMALL FARM… how much to plant? A very detailed site to get ideas for growing food to feed a family or community. Starting a sustainable small farm…how much to plant? I recommend starting small. We started our first CSA on our new farm in the spring/summer of 2005, feeding 26 families on 1/3 of an acre with a troybilt tiller and a hoe. This was the beginning of what turned into a 100 member CSA after two years. Inexpensive passive solar greenhouses heated only by sunlight falling on 55-gallon barrels of water are effective for growing plants year-round, said a University of Missouri Extension specialist. Heat from sunlight is stored in water-filled barrels during the day and radiates at night, replacing use of fossil fuel, said Eric Lawman, an agronomy research specialist at the Bradford Research and Extension Center (BREC) near Columbia, Mo. “Passive solar greenhouses extend the growing season and allow plant production year-round,” Lawman said. Temperatures inside an experimental passive solar greenhouse at BREC did not fall below freezing during the past two winters, Lawman said, while daytime temperatures have reached into the 80s. There is a similar greenhouse at the MU Southwest Center in Mt. Vernon. Our flag might be red, white and blue, but green has become Americas favorite color.